The South Island is less populated than the North and appears to have a slower pace of life, with sheep-filled pastures and remote farm settlements backed by rugged snow-covered mountains. The scenery is magnificent, and with its alpine mountains, fjords, glaciers, lakes and forests it is possibly even more spectacular than the North Island. Often arrogantly referred to as 'the mainland' by South Islanders, the South is the main destination of New Zealand tourism. 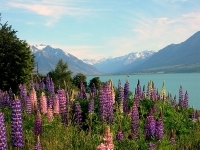 The southwest holds some of New Zealand's finest scenery and natural wonders, including its highest mountain, Mount Cook or Aoraki, 'cloud piercer'. The Frans Josef and Fox Glaciers stretching down to within a few kilometres of the coast, the magnificent Fjordland National Park with beautiful fjords, waterfalls and forests, and several world-famous walking tracks. We are looking for contributors for our South Island travel guide. If you are a local, a regular traveller to South Island or a travel professional with time to contribute and answer occasional forum questions, please contact us.